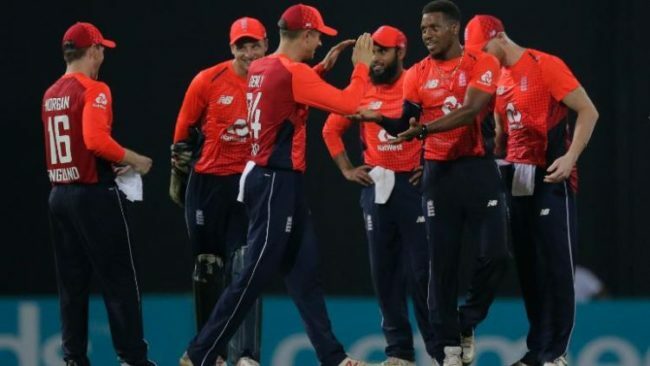 Joe Denly took four wickets in his first England match in eight years as the tourists beat Sri Lanka by 30 runs in the sole Twenty20 international. Denly opened the bowling and removed both Sri Lanka openers Niroshan Dickwella and Kusal Mendis. Adil Rashid claimed 3-11 to stifle the hosts before Denly returned with two wickets in the final over as Sri Lanka were bowled out for 157 off 20 overs. Jason Roy hit an eventful 69 off 36 balls as England posted 187-8. The England opener was dropped four times and ran out captain Eoin Morgan but also hit six sixes in a brutal display of power. The tourists reached 113-4 off 11.2 overs before rain caused the match to be delayed for an hour, but no overs were lost in Colombo. Sri Lanka did well to restrict their opponents at the death but never got on top in the chase, despite 57 off 31 balls from captain Thisara Perera, with Denly returning the best figures by an England spinner in T20 history. England next face Sri Lanka in a three-Test series, starting in Galle on 6 November. Denly was not a bowling option when he last played for England in a T20 against Pakistan in February 2010 but has developed his leg-spin and now opens both the bowling and batting for Kent in domestic T20s. It was still surprising to see him given the new ball here but it proved a shrewd call by Morgan, with the 32-year-old finding drift and Kusal heaving across the line at a ball that did not turn to be bowled off the final ball of the first over. Dickwella then similarly played for spin that was not there and lost his off-stump as Sri Lanka fell to 16-2. Dinesh Chandimal (26), Dhanajaya de Silva (17) and Kamindu Mendis (24) – who displayed his ability to bowl with both arms in England’s innings but is primarily a batsman – tried to counter but all fell to the superb Rashid, who claimed career-best figures. Perera blasted six sixes but had little support from the other end as Liam Plunkett bowled Dasun Shanaka for 10 and Chris Jordan removed Udana (2) and Amila Aponso for a duck. With the hosts needing 39 off the last over, Denly returned to mop up the remaining two wickets, having Perera caught in the deep by Roy and bowling Malinga off the last delivery of the match. Ed Smith may have raised some eyebrows when he talked up Denly’s leg-spin on picking him for the tour but it already seems this could be another smart call by the England selector – only Ravi Bopara (4-10) has better figures than Denly in a T20 for England. England’s innings was a thoroughly entertaining mix of boundaries and blunders, epitomised by Roy. His strike rate was 191.67 but he was dropped on 20, 34, 40 and 53 – the last three coming in nine balls as substitute fielder Sadeera Samarawickrama and Shanaka spilled simple catches at deep mid-wicket and long-off before Laskhan Sandakan shelled a tougher chance running in from deep cover. Adding to the embarrassment for the hosts, a member of the ground staff took a superb catch off a Roy six the ball after Sadeera’s drop. Roy was also involved in two mix-ups, first finding himself stranded down the ground after Jos Buttler stayed home, only for the throw to hit Roy as he ran back, with the third umpire ruling the England opener had not deliberately obstructed the field. Roy later set off for a run without calling a hesitant Morgan through and the unamused England skipper was run out by Sandakan at the non-striker’s end for 11. There were two poor umpiring decisions – Alex Hales given out lbw to a ball that would have spun past the stumps, while Ben Stokes was not out to one that would have hit – with Roy advising Hales not to review and Sri Lanka deciding against a review for Stokes. Roy finally fell nicking a wide delivery from Sandakan through to wicketkeeper Dickwella before unsuccessfully reviewing. Ben Stokes (26) hit the last ball before the rain delay for six and Moeen Ali took up the onslaught after the resumption, clattering three sixes in quick succession before he missed one heaving across the line and was bowled for 27 off 11 balls. Sri Lanka seamers Lasith Malinga and Isuru Udana limited England to 37 off the last five overs, the veteran Malinga bowling Stokes with a dipping slower ball full toss before having Denly caught for 20.